The girls played OK tonight. 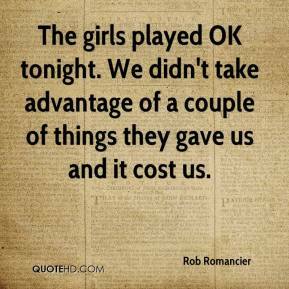 We didn't take advantage of a couple of things they gave us and it cost us. Let's face it. The obsession that the industry, especially cable channels, have to stories about missing, pretty white girls has gotten a little ridiculous. 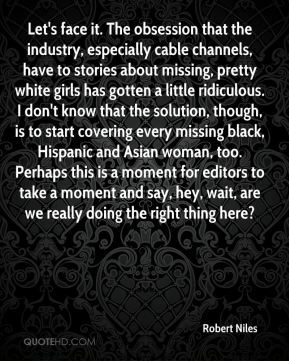 I don't know that the solution, though, is to start covering every missing black, Hispanic and Asian woman, too. Perhaps this is a moment for editors to take a moment and say, hey, wait, are we really doing the right thing here? State is what these girls have worked so hard for. It's every team's goal, and we have a special group. I can't be more pleased for our girls. 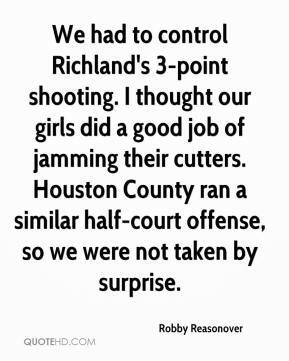 We had to control Richland's 3-point shooting. 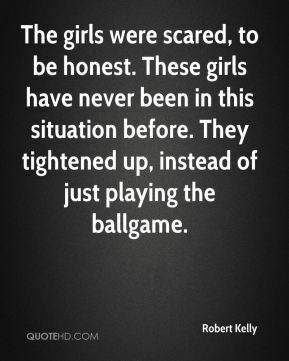 I thought our girls did a good job of jamming their cutters. Houston County ran a similar half-court offense, so we were not taken by surprise. Shannon Hicks did real well. I can't enough about all the junior girls, they all stepped up and did tremendous. We got really lucky with an awesome group of girls -- it's so much fun. I see at least one injured cheerleader a day. It's from a combination of insufficient conditioning and dangerous routines. 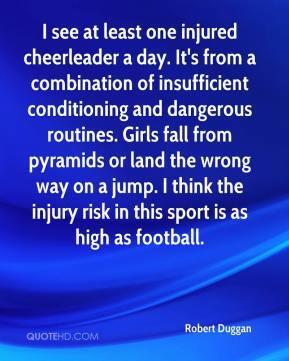 Girls fall from pyramids or land the wrong way on a jump. I think the injury risk in this sport is as high as football. My expectations are always out the roof. 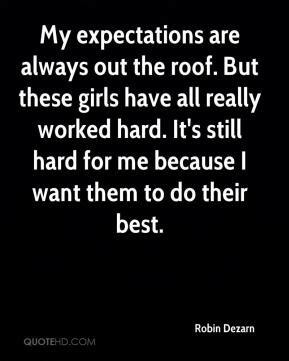 But these girls have all really worked hard. It's still hard for me because I want them to do their best. 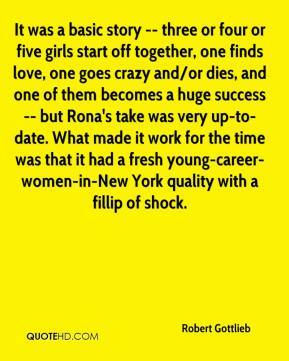 It was a basic story -- three or four or five girls start off together, one finds love, one goes crazy and/or dies, and one of them becomes a huge success -- but Rona's take was very up-to-date. What made it work for the time was that it had a fresh young-career-women-in-New York quality with a fillip of shock. The girls were scared, to be honest. These girls have never been in this situation before. They tightened up, instead of just playing the ballgame. 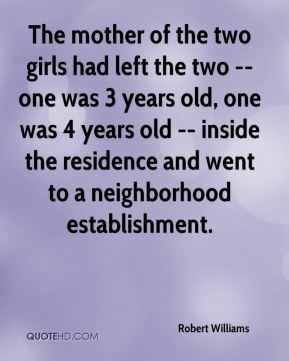 The mother of the two girls had left the two -- one was 3 years old, one was 4 years old -- inside the residence and went to a neighborhood establishment. 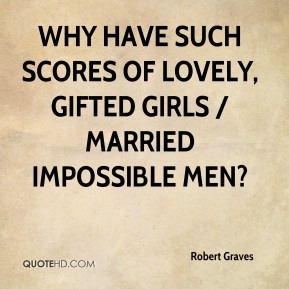 Why have such scores of lovely, gifted girls / Married impossible men? What a wonderful world it is that has girls in it! 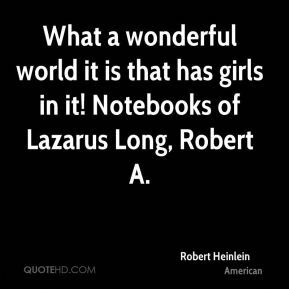 Notebooks of Lazarus Long, Robert A. 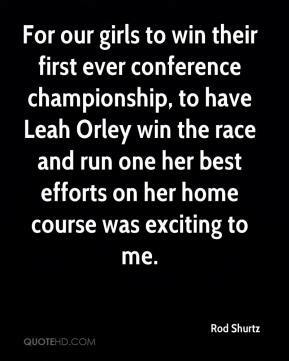 For our girls to win their first ever conference championship, to have Leah Orley win the race and run one her best efforts on her home course was exciting to me. 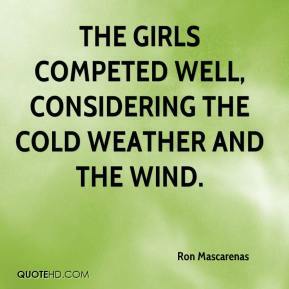 The girls competed well, considering the cold weather and the wind. It was a defensive letdown. We talked to the girls about it. 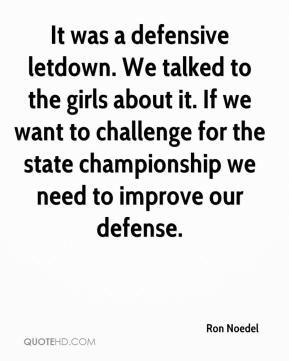 If we want to challenge for the state championship we need to improve our defense. 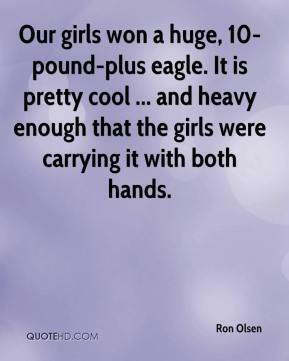 Our girls won a huge, 10-pound-plus eagle. It is pretty cool ... and heavy enough that the girls were carrying it with both hands. 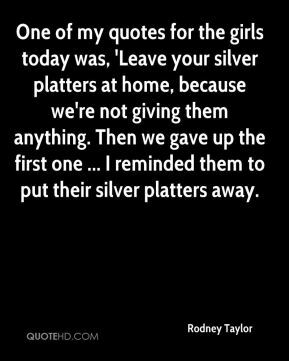 One of my quotes for the girls today was, 'Leave your silver platters at home, because we're not giving them anything. Then we gave up the first one ... I reminded them to put their silver platters away. 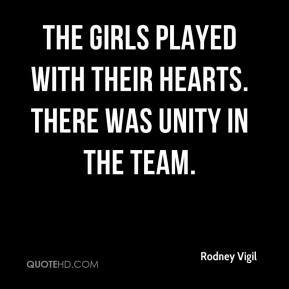 The girls played with their hearts. There was unity in the team. We knew that they were going to come out and run. 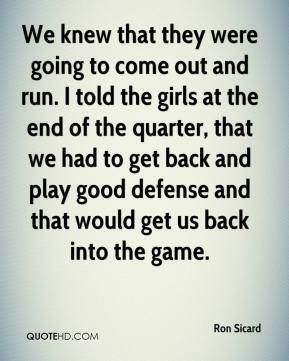 I told the girls at the end of the quarter, that we had to get back and play good defense and that would get us back into the game. 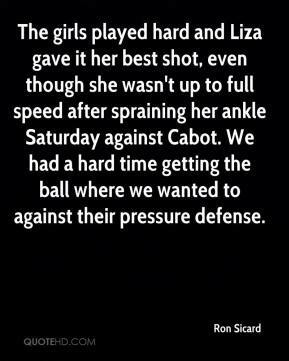 The girls played hard and Liza gave it her best shot, even though she wasn't up to full speed after spraining her ankle Saturday against Cabot. We had a hard time getting the ball where we wanted to against their pressure defense. 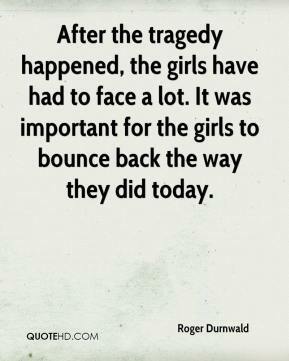 After the tragedy happened, the girls have had to face a lot. It was important for the girls to bounce back the way they did today. [In] An Intelligent Person's Guide to Modern Culture, ... 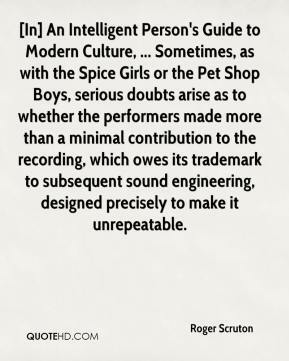 Sometimes, as with the Spice Girls or the Pet Shop Boys, serious doubts arise as to whether the performers made more than a minimal contribution to the recording, which owes its trademark to subsequent sound engineering, designed precisely to make it unrepeatable. Girls are better at it. 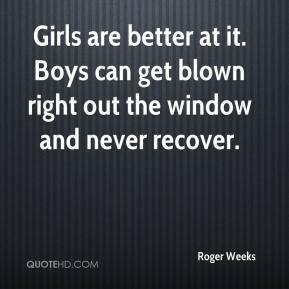 Boys can get blown right out the window and never recover.